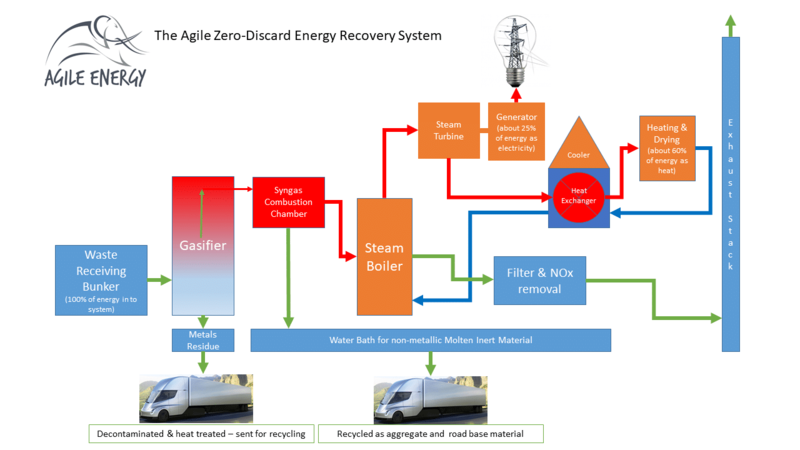 Agile Energy Recovery Limited is developing a low carbon energy park near Inverurie in North East Scotland. The catalyst is an Energy Recovery Facility (ERF) power plant due to come online in 2022. We will start construction work in 2020, following successful planning/licensing applications and engagement with the local communities. We also have plans for several exciting complimentary businesses that will be a showcase for sustainable efficient use of the electrical and heat energy from local power plants. Our directors are all from Aberdeenshire in the North East of Scotland and come from a varied background in engineering, project development and management, waste management and information technology. Perhaps most importantly, we are all entrepreneurs with a passion for improving the environment and employing the best technology to that task. The Briksdal Glacier in Norway has receded and grown again several times in the last century and has receded further up the mountain since this photograph. Manmade global warming is the cause or not? - perhaps the jury is still out. Much as we would like to, we do recognise that we cannot save the planet single-handedly, so our mission is to ensure that the Inverurie Energy Park is an example of best practice, becoming a beacon for projects that follow and an example of how such projects can best contribute to the circular economy. We will involve the local community in shared ownership, use the best available ERF technology, ensure that we do not use viable recyclable material as fuel, make certain that we do no harm to people or the environment and ensure the project delivers a sustainable model which is commercially attractive for our investors. We are working to attract complimentary businesses to the park which can take advantage of being co-located and secure commercial advantage from supply of competitive electricity and heat for the plant. Increasing awareness of the dangers of plastic waste getting into the environment and the risk to aquifers and water supplies from landfill continue to drive an increasing need for responsible waste disposal that has some benefit to society. With a measure of imagination and vision it is possible to turn a polluting waste which poses serious threat to the environment, and turn that waste into fuel. With the correct application of a variety of technologies and a community focused approach we are convinced that the project will become an exemplar for projects to follow. 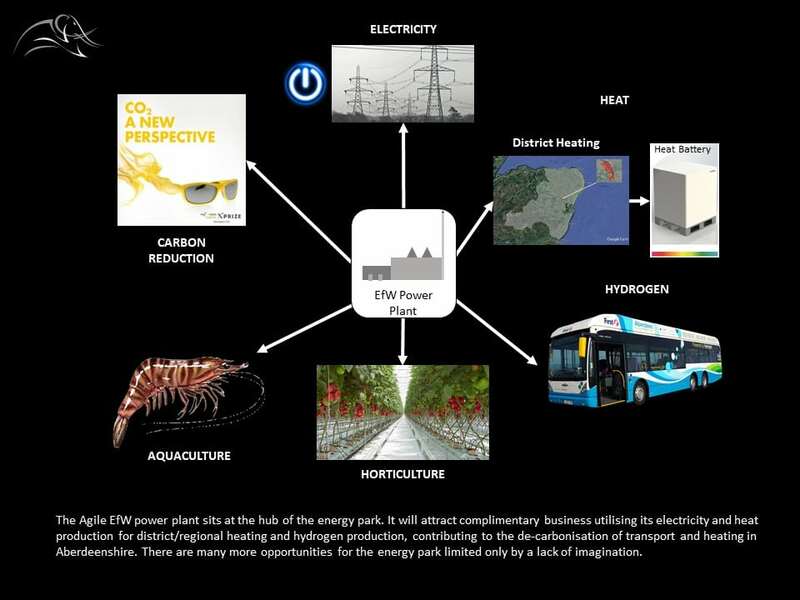 Agile’s energy park approach attempts to address this need in a variety of ways and specifically we are developing a community owned and run district heating network that will be provided with heat energy by the power plant. In the UK, the traditional disposal route for waste materials that cannot be recycled has almost always been to landfill. This is unsustainable, wasteful and damaging to the environment – landfill gas produced by decomposing biodegradable material in landfill sites is methane and this gas is 23 x more damaging to the atmosphere than carbon dioxide (CO2). As well as preventing this happening, ERF projects create energy in the form of electricity and hot water for heating houses or cooking/drying in an industrial process. Agile Energy will use an advanced integrated energy conversion process, with world leading energy efficiency and producing significantly less emissions than currently available technology. It will simply be the best technology available for this purpose. This choice of technology is very important for a number of reasons not least of which is that it addresses the increasing concern around the emissions to atmosphere of small particulates. Sweden has been employing energy recovery from waste materials to heat homes in the bigger cities such as Stockholm since the 1960’s. Indeed, Sweden has expanded the model to an extent that less than 1% of waste produced goes to landfill and they are importing waste from the UK and other European countries to provide them with the additional fuel they need. Watch the short video below for more information. Our process will be highly efficient in converting the energy in the waste to electricity and around 90% efficient when we deliver and use all of the heat from the plant. Look at our very simple generic process flow diagram below (click on the diagram below to zoom in) to get an idea of how the process works and where all the energy comes from and goes to. This diagram is typical of a Rankine cycle based steam production system. Recall from school physics, that energy is never lost, it only changes form. So, all the energy contained in fuel, be it petrol, diesel, coal or waste materials is 100% converted from potential energy into other forms of energy such as movement, heat and noise when it is used as fuel for a power plant. Most older power stations (and many new ones unfortunately) waste up to 80% of the available energy in heat by discharging it to the atmosphere – that is what cooling towers do. Our power plant is designed to be as efficient as current technology allows and will not be wasteful of the energy available. Our HSE Advisor, Alan Wilson also happens to be an award-winning wildlife photographer and we present one of his superb photographs here every week which we hope you will enjoy. Here we will post project progress and other photos of general interest related to the project together with a time lapse record of construction activities on the site. You can click on any photo to expand the whole gallery. Now listen up you lot - this is the greatest investment on the planet so pay attention! If you are a registered investor with us, please click the ‘Go to Investor Area’ button below to gain first time access to our data room. To gain access to our data room, project progress reports and other confidential information, please complete the ‘Contact’ page and request a call from our investor representative to discuss your interest. The ‘Go to Investor Area’ button below takes you to a ‘DropBox’ window requesting a password which will be e-mailed to qualified investors following registration. Simmons & Company International – Energy Specialists of Piper Jaffray is lead advisor for Agile’s equity and debt funding activities. Their deep knowledge base regarding energy issues enables them to help design the optimum capital raising strategy for the project. Maclay Murray & Spens LLP, the Scottish law firm that has been supporting Agile on its journey to date, is joining forces with the world’s largest law firm Dentons, providing us with access to the largest array of legal talent in the world. The new legal firm will put the resources of one of the world’s most innovative and forward-thinking law firms at our disposal. Led by Bill Fowler, the Energy & Utilities team specialises in three key areas of the market: Oil & Gas, Renewables and Utilities. With a core team of 25+ lawyers, the dedicated multi-disciplinary renewables team includes specialists from MMS’ Banking & Finance, Capital Markets, Capital Projects, Construction & Engineering, Corporate, EU, Competition & Regulatory, IP & Technology, Planning & Environmental, Property and Tax Departments.